This cartoon hates the way old people are always carrion on. | the rut. This cartoon hates the way old people are always carrion on. Man…I saw this comic loading, and before the caption loaded, I thought it was one of the best cartoons I’d ever seen. Then the caption loaded and it killed it for me. Please lose the caption. The cartoon’s 1000000% better without it. Captain super-obvious isn’t at home today. Mike, I may agree with you. But let’s market research the sucker – I’m too close to it. Who agrees the caption is unnecessary? PS. Captain Super-Obvious IS home. He told me so just after I rang his doorbell and he answered the door. Hey, it’s not so obvious for us non-western types you know. It might be a joke on Belgium/Spain. And that’s in an aussie news site. Mikey is that you? If yes that was way harsh, if no you have a valid opinion and that I respect however I am not sure how your cartoon loaded before your caption as it usually does it the other way around. Having said that I as usual thought it was clever and very funny Philly. Thanks for the memories. 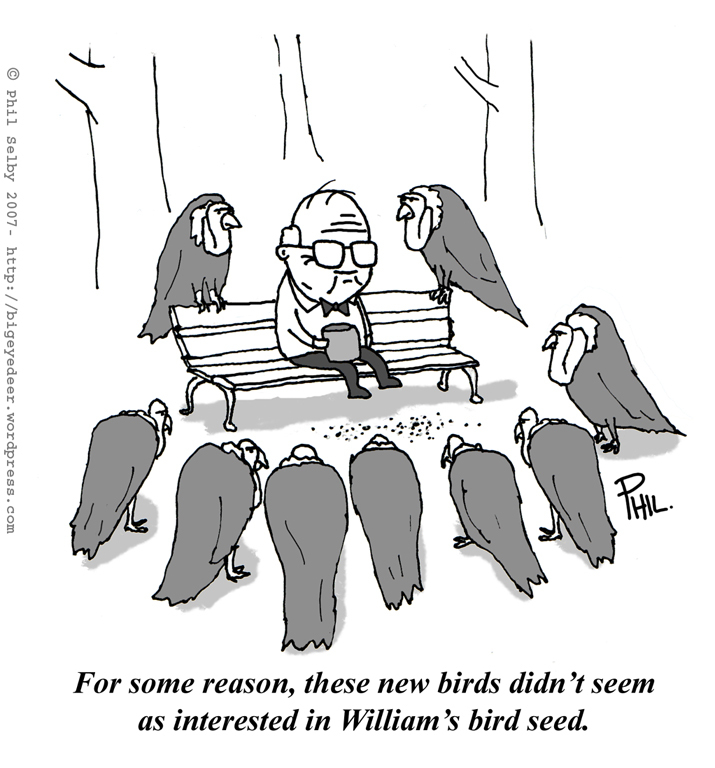 The caption does two things; it explains William’s inner dialogue and explains the bird seed. I think that this correction is unnecessary. The joke is rendered more effective, more sinister, if you will, as this IS indeed dark humour, because of what it leaves unsaid. “as William’s old birds had been.” Too literal. “as they were in William’s corporeal form.” As intended. Oh, caption or no caption…I love it! The two perched on the corners of the bench are perfect. I think William looks a bit like Orville Redenbacher…. WHOA! Can of worms! 🙂 Thank you all for your advice. But being a stubborn S.O.B I’m gonna just leave it the way it is. Or is it just because I’m too lazy to change it? Who can say. I think this just reinforces the fact that everyone finds different things funny in different ways. And I think there’s something in that for all of us. Thanks again for stopping by, and remember: take care of yourself… and each other. PS. Lis, no that’s not the Mike you know, it’s a different one! What a pedantic lot some of you are! AS a 66 year old who does on occasion sit on park benches…I loved it – as ever – and the vultures are terrific. Made me haw, haw, haw ol. Makes them twice the fun! And twice as complicated to think up!! kmii, “pedant” doesn’t begin to cover what we’re capable of! We’re the intarweb generation ! Here’s hoping to you carrion on for at least a while more! Two Cheers For Irregular Cartooning ! * = 2×2 square matrix of “cheers”. As opposed to a conventional 3×3. Heh, heh. Old man food for vultures. People who don’t find this funny: Kindly contact your nearest Parsi (Zoroastrianism) Fire Temple. They’re running short of people anyways. Nimish, been away for a couple of days…visiting Lexington and Concord, you know, those patriotic places “Shot heard around the World and all that? Anyway, I think you may be right about the wording of the caption (which means bigeyedeer is correct). Just wanted you to know. I’ll be acting all smug in the market tomorrow, where I shall purchase a pair of glorious football boots ! Nimish “smug” Batra… that’s me ! PS: Does anyone else get a vision of their respective national flag being approached by a flying saucer the size of Japan, which then crashes as an Apple™ computer makes and launches a computer-virus-laden-missile into its reactors, whenever someone says “Independence Day”, or is it just me? Erm, was it a homeage to Larson? Two old men sitting on a bench, surrounded by pigeons. And two vultures. Well, I guess that makes it an unwitting homeage to Larson. Anyway, you’re not accusing me of nicking ideas, are you? ‘Coz I can assure I never would. Sometimes two people have the same ideas. Some of my old toons I have never posted because I’ve since seen the same throwaway gags on Family Guy and Simpsons etc and would rather not post than have people think I just lifted the idea. S’alright, wasn’t accusing of stealing. Believe me, I know about people having the same ideas. The number of times I’ve let go a one liner to the person next to me in a crowd situation, and someone else says the same thing just after, only louder and to the whole group. Hello. I just had to make the effort to tell you this is great! The line is really good, and yes a great addition. I admit I didn’t sift through ALL of the commentary but it implies he has been feeding birds for a long time, and a new sign of old age has presented itself. This is damn funny, and I think everyone has felt doomed. I write, and draw cartoons myself. Sometimes a good line inspires a person. I love this. Very clever. Don’t change a thing. I wish there was a link I would send it to a friend right now. how do you get permission to use it? « This cartoon is praying to get lucky.